The price of oil has been rising lately. This is at least partly due to the prospect of Israel attacking Iran (something I’ve written about separately). Here is a simple low risk trade that could pay off if Israel attacks Iran. This strategy relies on a “trailing stop order.” Before I get into the details of this particular trade I want to explain this type of order. A sell trailing stop order sets the stop price at a fixed amount below the market price with an attached “trailing” amount. As the market price rises, the stop price rises by the trail amount, but if the stock price falls, the stop loss price doesn’t change, and a market order is submitted when the stop price is hit. This technique is designed to allow an investor to specify a limit on the maximum possible loss, without setting a limit on the maximum possible gain. The idea for this trade is to enter oil now, before it gets much higher, in advance of potential hostilities. After a position in oil is established, add a trailing stop. This will allow you to profit as oil goes up, and to exit automatically on a dip. Oil is volatile, so setting the exit point is tricky. My approach would be to enter a long position in oil now, without the trailing stop. Once oil begins to rise in earnest. I would set the stop at about 3% below the current price. Your downside risk is set by the stop order. If you are strongly risk averse you can place the trailing stop immediately and your maximum loss will be set at that level. Overall, I think it is wiser to wait for the oil rise before setting that stop. The most liquid ETFs that track oil include: USO, UCO and OIL. I’ll entry by trades here as I make them. disclosure: The author expects to be long USO. Now we’ve printed a lot of money (that is, we’ve monetized a lot of debt), but with unemployment above 8.2% (more likely at 8.4%) I don’t see massive inflation happening just yet. Finally, the US owns the refining process (a fact that both Venezuela and Iran hate) despite China’s recent $40 billion investment in refining operations. While Venezuela and Iran would love to drive oil prices up to $140/barrel to spur global refining investment, the dollar has something else in mind. The US has been exporting 15-20% of its refined fuel (especially diesel) to Latin America. If a rising dollar occurs, how much more demand will you see for our gas? Do you think we will continue to export or will it be cheaper to meet US demand (with exports on the decline)? Our paper’s been pretty cheap for a while (if you’re a bank). The S&P in terms of gold (no. of ounces to purchase the index) is at an incredibly low level. There’s only one way for interest rates and the dollar to go – up. 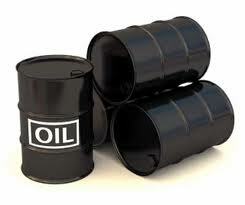 In like manner, there’s only one way for oil to go – down.